Jackson Hole Traveler is published in Jackson Hole, Wyoming by locals who live the experience every day and share their local insight through the Traveler brand. Jackson Hole and Grand Teton National Park represent one of American's great playgrounds, as we are surrounded by public lands that give endless access to the natural beauty, wildlife, and recreational adventure this locale affords. To complement the great outdoors, the towns of Jackson and Teton Village have created a welcoming amenity base of lodging, restaurants, spa,s and shopping to help you recover from your days skiing, in the saddle, hiking the Tetons, floating the Snake River, or just wandering the wooden boardwalks of downtown. Our mission is to help you get the most out of your vacation, by informing you of your options and what makes this place tick. Our guides are designed to help you with the "context needed" around decision making so you can plan your time wisely and not miss anything that might be on the bucket list for your Jackson Hole vacation. Our print guide gives a great overview (including a fold-out interpretive map), while this digital offerings completes the story with more information, contact details, and navigation information. Thank you for using our brand and we always welcome your feedback! 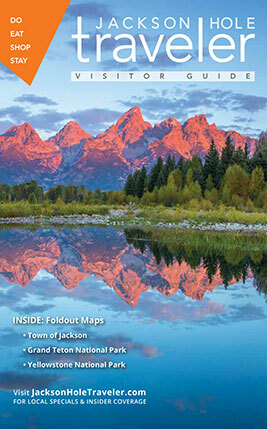 Circ is the design & media agency behind the Jackson Hole Traveler experience.